Are you a pet owner or do you work with pets? Do you think you could you help your pet or a pet in your care in an emergency situation? Our courses are run by a veterinary nurse and are 3 hours long. The course is aimed at pet owners and pet professionals. It’s focused on Dogs and Cats and you will learn how to respond to health emergencies and provide basic first aid to your pet. Your pets have accidents just like humans and knowing what to do should the worst happen may be vital in a First aid emergency. We run courses in and around Surrey and Hampshire. We also take larger group bookings for a reduced cost. Course topics: CPR, seizures, bleeding, wound treatment, poisons/toxins, bites and stings, common injuries and much more. On completion of the course you will recieve a Certificate of attendence and also the opportunity to purchase a First Aid kit. The course takes place at your place of work or home. Course price: £35 per person. Course price reduced to £30 per person if 6 or more people book on to one course. Minimum of 2 people per course. 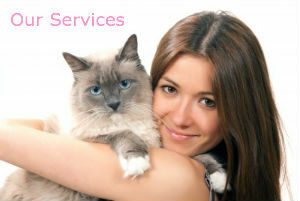 "Precious pet services look after my 3 babies when we go away and they adore all of the pet sitters. All so trust worthy and clean and tidy. Thank you."